This is the all-in-one Tibet experience that gives you all the famous sights Tibet has to offer. Besides a comprehensive cultural tour, this itinerary takes you to the awesome Himalayas by doing 6 days trekking from the village of Old Tingri all the way up to Everest Base Camp at 5.400 meters! The first days you will explore the palaces, monasteries and Buddhist arts and architectures in Lhasa, Gyantse, and Shigatse. The trekking commences on the 7th day. From Ol Tingri, its 5 days trekking to Mount Everest Base Camp. The trek offers the finest views of the north face of Mt. Everest. Finally, you will drive back on the famous Friendship Highway through dramatic scenery change to the capital of Nepal, Kathmandu. Day 01:Fly from Kathmandu to Lhasa. The capital of the Tibet Autonomous Region in the People’s Republic of China. It is located at the foot of Mount Gephel and is one of the highest provincial capitals in the world. It is the location of the Potala and Norbulingka palaces (both are included as World Heritage Sites and is the birthplace of Tibetan Buddhism. The Jokhang in Lhasa is regarded as the holiest centre in Tibet. Lhasa literally means “place of the gods”. At an altitude is 3,490 metres (11,450 ft), Lhasa is one of the highest cities in the world, covering a flat river valley in the Himalaya Mountains. Day 02-03:Sightseeing tour of Lhasa. Day 04:Drive to Tsedang via Samye. Tsedang County sits on the south bank in the middle section of the YarlungTsangbo River with a moderate climate at an altitude of 3,600 meters. The mild weather and fertile land in Shannan gestated the great Tibet dynasty. Tsedang is considered as the birthplace of earliest Tibetans who were said to be the offspring of a monkey and a demoness, so Tsedang literally means “monkey’s playground”. In Samye you see the Samye Monastery or Samye Gompa which is the first Buddhist monastery built in Tibet. Day 05: Drive to Gyantse. Gyantse is notable for its magnificent tiered Kumbum (literally, ‘100,000 images’) of the Palcho Monastery, the largest chörten in Tibet.The town is strategically located in the Nynang river on the ancient trade routes. From Gyantse, routes led to Shigatse downstream and also over the Karo La (Pass) to Central Tibet. Shigatse the second largest city in Tibet. Shigatse contains the huge Tashilhunpo Monastery, founded in 1447 by Gendun Drup, the First Dalai Lama. It is the traditional seat of the Panchen Lamas.The imposing castle, Samdrubtse Dzong or “Shigatse Dzong”, was probably built in the 15th century. It looked something like a smaller version of the Potala, and had turret-like fortifications at the ends and a central Red Palace. Day 07: Drive to Old Tingri via Sakya Monastery camp. Sakya Monastery was built in 1073. It is located in the city of Sakya, in the Tibetan region of Tsang, about one hundred miles north of the border between Tibet and Nepal. The region is unique for its gray (kya) earth (sa), hence the name Sakya. The buildings contain thousands of statues, paintings, murals, stupas, mandalas, and other holy objects, as well as libraries of scriptures in Tibetan, Chinese, Mongolian, and Sanskrit piled from floor to ceiling. Tingri is a traditional town in southern Tibet with a population of around 523. It is often used as a base by mountain climbers preparing to ascend Mount Everest or Cho Oyu. Tingri used to be an important trading post where Sherpas from Nepal exchanged rice, grain and iron for Tibetan wool. livestock and salt. It gives its name to the broad upland basin more than 4,500 metres high that is known as the Tingri Plain. 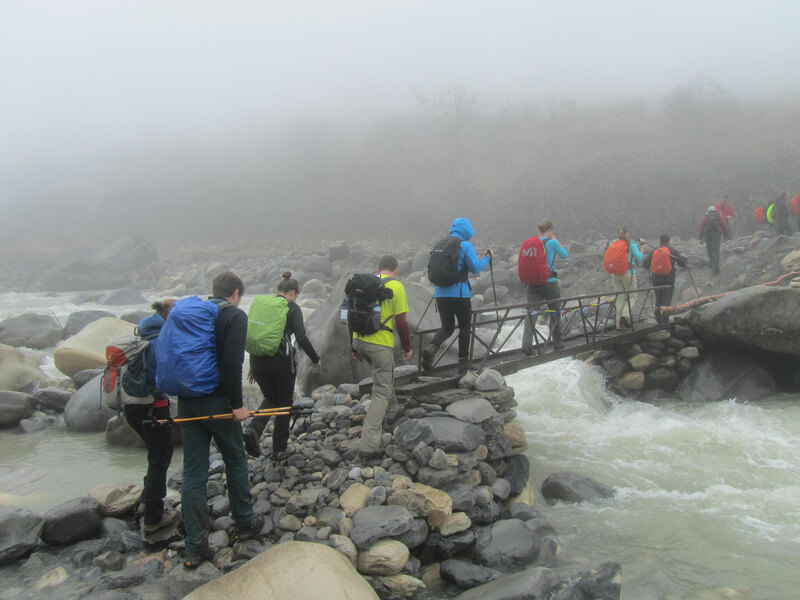 Day 08-12: Today we start our trekking from Tingri to the Mount Everest Base camp at Rongbuk. You will be sleeping in tents and accompanied by our professional team of guides, a cook and all luggage will be transported from one camping site to another. Your camping crew will set up the various camps. So only you need a pair of good boots and enjoy the views of surrounding mountains. Further on, barren plains open up. Amazingly, even in these barren fields local villagers yield good harvest of barley. Mostly, you will find herders in this territory. Due to the height, you may find the trail quite strenuous. But as soon as your eyes bask in the splendor of majestic vistas of surrounding mountain peaks, you will realize that this trek has indeed been very self-rewarding and worthwhile. On the last day we finish at Rongbuk, along Rongbuk Glacier. The North Face of Everest becomes visible flaunting its unparalled beauty. Rongbuk Monastery lies ahead 15 kilometers below Everest Base Camp at 5,100 metres above sea level, making it the highest religious building, as well as one of the highest-elevation settlements and overall structures ever built and colonized. It is only 200 metres (660 ft) lower than the north side Everest Base Camp of Mount Everest. Climbers must pass through Rongbuk in order to reach the highest peak of Mount Everest via the North Face. It has been described as having some of the most dramatic views in the world, presenting a panorama of the Shishapangma, Mount Everest, Cho Oyu, and Gyachung Kang peaks to visitors. Day 13: Today we will do a short trekking to explore Everest Base camp. These camps are rudimentary campsites on Mount Everest that are used by mountain climbers during their ascent and descent. You find here a permanent structure is for mountain climbers, central-left structure is for pit toilets, while the temporary wood-frame, plastic tarpaulin-covered structures below and right are for other visitors and support people. Also today you can explore the intriguing Rongbuk Monastery and have some Tibetan Tea inside at the stove and talk to the local inhabitants. Day 14: After all trekking you can sit back and relax a beautiful drive on the famous Friendship Highway. Today we drive to Shegar. The Friendship Highway is a celebrated route in the Tibetan Plateau, renowned for its scenic wonders. It includes the westernmost section of China National Highway 318 (from Lhasa to Lhazê, and from Lhazê to the Nepalese border at Zhangmu).In Shegar you find a Monastery, built in 1269. There is an inside painting that tells the monastery at its height. Day 15: Today we drive further over the Tibetan plateau to Zhangmu. which changes the scenery completely! Zhangmu is a customs town and port of entry located in Nyalam County on the Nepal – Tibet border, just uphill and across the Bhote Kosi River from the Nepalese town of Kodari. At 2300 meters above sea level, Zhangmu has mild and humid subtropical climate, which is a rarity for Tibet. Trucks traveling on the Friendship Highway offload goods at Zhangmu and transfer them to trucks from the opposite country. The single narrow zigzag street of Zhangmu makes this an especially difficult operation, but it is a very interesting experience. Day 16:We drive back to the capital of Nepal, Kathmandu. It is a lovely drive troughout the greenlands of the Kathmandu valley. Friendly people made my first tracking experience a great one.